Emmons off New York Navy Yard, 21 March 1943. Emmons at Normandy in paintings by artist Dwight Shepler, who was embarked during the invasion. The US Navy’s 100th modern (post-1930) destroyer—its newest when American entered World War II—was a “noble ship manned, loved, and fought by a noble crew” whose record exemplified the diverse history of the first “Bristol-class” destroyers: USS Emmons (DD 457). 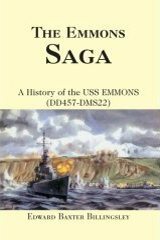 Emmons’ eventful record is wonderfully captured in a book written by her third commanding officer in collaboration with the crew. Read an excerpt. Visit the Emmons web site. “A great favorite of her squadron,” Emmons operated from South America to the Arctic through every major Atlantic and Mediterranean campaign—excluding only the Sicily and Italy landings—without casualties or damage. When the Atlantic war ended, she was converted as a high speed minesweeper and sent to Okinawa. There, while defending her close sister Rodman, she ran low on ammunition, was overwhelmed by kamikazes and lost. Emmons was laid down 14 November 1940 with Macomb, together the last destroyers of the 1,630-ton Gleaves-class built at Maine’s Bath Iron Works. Christened in honor of a prominent Civil War-era officer, she was launched 23 August 1941. After commissioning at Boston Navy Yard on 5 December and shakedown with Hambleton on a diplomatic mission to South America’s west coast, she joined Macomb and Federal-built Ellyson, Hambleton and Rodman in Destroyer Division 19 of Destroyer Squadron 10. Operating mainly in the Atlantic and later in the Mediterranean Sea over the next two years, “Easy Money” was detached a week before D-day to join DesRon 18 for the Normandy invasion, substituting for Endicott*. Off Omaha Beach on D-day, 6 June 1944, she distinguished herself with accurate counterbattery fire; then participated in the bombardment of Cherbourg before returning with DesRon 10 to the Mediterranean for the invasion of southern France. Converted at Boston as high speed minesweeper DMS 22 in November–December 1944, Emmons, with her squadron, then was sent to the Pacific as part of Mine Squadron 20 for the invasion of Okinawa. There, northeast of Ie Shima in the first mass kamikaze attack, 6 April 1945, she steamed to the defense of Rodman, which had been hit. Only after she ran low on ammunition did five suicide planes break through and hit her in a two-minute span—four more landed close aboard—killing one-quarter of her crew and wounding one-quarter more. The hits left her burning and drifting toward an enemy-held sector of the Okinawa coast until flagship Ellyson was ordered to sink her. In addition to the Navy Unit Commendation for her action at Okinawa, Emmons earned five service stars during World War II. In February 2001, Emmons’ wreck was discovered at a depth of about 140 feet, one of the few American ships lost off Okinawa in waters shallow enough for access by experienced divers. A strong shipmate organization, the USS Emmons Association, continues to hold reunions every year. * Endicott was damaged in collision with freighter SS Exhibitor in the Irish Sea on 24 May.